1. To understand colligative properties of solutes. 2. To find the freezing point depression of a solution. 3. To determine the van ‘t Hoff factor of solutes. 4. To find the molar mass of an unknown solute. The freezing point of a liquid substance is the temperature at which the liquid and its solid form are in equilibrium. 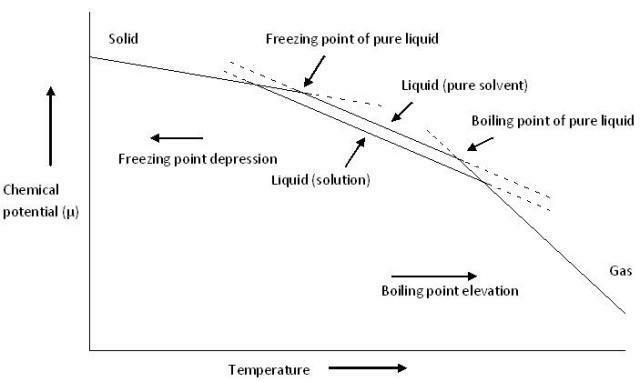 The phenomenon that the Freezing point of a solvent will be lower when another compound is added is known as depression in freezing point, i.e., a pure solvent has a higher freezing point than a solution. This happens whenever a solute is added to a pure solvent. It is also a colligative property — dependent only on the number of particles added and not the kind. It is defined as the difference in the freezing points of the pure solvent and solution, the difference between the freezing points of the solution, and the pure solvent, . This is a colligative property which does not depend on the nature of solute particles but depend only on the number of those solute particles in solution. The elevation of the boiling point can be calculated by applying the assumption of the non-volatility of the solute together with the Clausius-Clapeyron relation and Raoult’s law. The vapour pressure of a solution of a non-volatile solute is equal to the product of the vapour pressure of the pure solvent at that temperature and its mole fraction. Where, is the partial pressure of the component i in the solution; is the vapour pressure of the pure component i; and is the mole fraction of the component i in the solution (in mixture). m is the molality of the solution; and i is the van ‘t Hoff factor. Molality of a solution is the ratio of amount of substance of solute and the mass of solvent in kg. · i = 1 for sugar in water. · i = 2 for sodium chloride (NaCl) in water, due to the its full dissociation into Na+ and Cl- ions. · i = 3 for calcium chloride (CaCl2) in water, due to its full dissociation Ca2+ and 2Cl- ions. The van ‘t Hoff factor is a measure of the colligative effect (the total number of particles) of the solute in solution. The value of i is usually unity for all non-electrolytes, greater than unity for electrolytes, but is less than unity for compounds that associate in solution. Where, R is the gas constant; is the freezing temperature of the pure solvent (in K); M is the molar mass of the solvent; and is the heat of fusion per mole of solvent. Note: although the above equation yields a positive value for , by convention is represented as a negative value, resulting in observed and calculated negative values for . Where, is the weight of the solute; is the weight of solvent; is the elevation of the boiling point; molal freezing point depression constant; and i is the van ‘t Hoff factor.